Janak Bahadur Shahi/Republica Construction of the Burausekhola Suspension Bridge, Humla has been in limbo for the last four years. HUMLA, March 27: Humla residents continue to risk life while crossing rivers in lack of safer bridges. They still depend on risky tuins (a makeshift cable crossing) to cross rivers and reach their destinations. It has been over five years since 11 suspension bridges in various parts of this district have remained under construction. And people do not know how long it would take to complete the construction of these bridges. The then District Coordination Committee had formed a consumer committee in 2013 to overlook the construction of bridges across the district and tasked it with the responsibility to issue a notice calling for bids to supply construction materials for building suspension bridges in 2013. As per the tender notice, the supplier company was expected to avail the required construction materials on time and construction of these bridges was supposed to complete within five years. But things did not progress as planned. Though work had started soon after the tender was passed, it could not proceed. Ghatekhola Suspension Bridge, Thadokohla Suspension Bridge, Sikpa Suspension Bridge, Dhakanikun Suspension Bridge, Machhari Suspension Bridge, Kharkohola Suspension Bridge, Mimikhola Suspension Bridge, Porigaun Suspension Bridge, Chartangre Suspension Bridge, Balukhola Suspension Bridge, and Chapetadi Suspension Bridge are in limbo after the contractor failed to resume work in lack of construction material. Because of these bridges, many other constructions that depended on these bridges to transport construction materials, have also been affected. It is not possible for individuals to carry construction materials to villages on their own. The terrains do not allow humans or cattle to move heavy loads and there are no roads to several rural areas. “We cannot build concrete infrastructures even if we want to. Only suppliers are capable of delivering construction materials at the construction site,” said Budha. 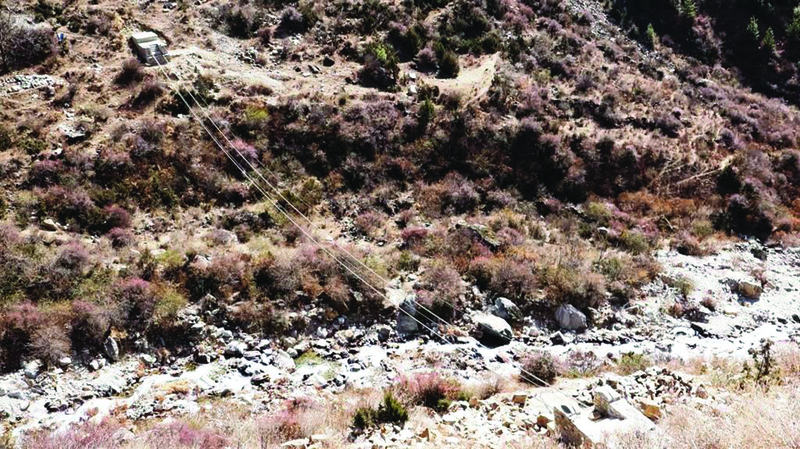 According to Devi Edi, the then chief technical engineer of Humla, Sonam Lama of Tarsi Cargo Delivery Service Company had taken the responsibility to supply of construction materials for Muchu, Ghatekola, Burause, and Sikpa suspension bridges. The responsibility of the supply of construction of seven other bridges was taken by Dipak Rawal of Arjun Nirman and Order Suppliers. Meanwhile, contractor Solam Lama while conceding of some delays, argued that the delay was not much. He said that construction materials for many of the bridges were supplied long ago, for the remaining ones it was supplied recently. “They try to put all the blame on us, but the delay was due to several reasons. It is not that we have not supplied materials at all. Construction materials have been delivered to construction sites of many of the bridges,” he said. He added that the materials were handed over to the concerned consumers' committee. However, locals fumed stating that the suppliers and the government officials come up with many excuses for not working. They also pointed figure to the chief district officer for being negligent on the matter. “If you ask the contractor, they always have some explanations ready to excuse themselves. And if you go to the government officials, they also say one or the other thing, but the issue is that the bridges, that were supposed to be completed by now, have not been completed,” said Budha. Budha has crossed rivers using tuins and ropeways throughout his life, many a time, he has barely saved from falling into the river. Contractor Rawal blamed engineer Edi of not doing his part of the job. “Apparently, its contractors who have not completed the work. But if you try to dig deeper, there are many issues,” he said. He stated that the then district development officer had directed engineer Edi to reassess the construction materials, which equaled to 8,000 kg. But the engineer did not pay attention to that. Without reassessing the materials further process on supplying the materials was stopped. “Since Edi was negligent and was not doing his job, I did not supply the rest of the materials to the respective committees,” he said. But engineer Edi refuted the charges and instead warned that the contractors would be booked for wrongdoings.